Congratulations to My Friends: Matt and Amy Baumgardner! Please indulge me for a moment. Today is one of those, “How amazing is this?” days. I am looking back over a short, crazy story that is often hard to believe. It began in May 2012. I tuned into an Oprah’s Lifeclass taping as I commonly do. I knew some of my friends were in the audience that day and that Mastin Kipp was to be featured so I tuned in to watch them and celebrate their day. I was listening and intermittently watching the episode and would occasionally tweet a comment. In one of the tapings the guest, Amy, was talking about an incident that had happened to her. Amy had been struggling with a drinking problem that she had been unwilling to recognize and her husband, Matt, had been unable to deter despite his best efforts. Everything came to a head when Amy got into the car with her two young children and proceeded to drive home after consuming several drinks. They never made it home and her daughter was nearly killed. The accident had happened two years prior but Amy was having trouble letting go and moving on. She was on the show to work with Iyanla Vanzant to overcome the guilt that was tearing her apart. I was listening to Amy’s story and thinking how lucky she was to have been given a second chance. My thoughts were of her children. I thought of them when I tweeted that I wanted Amy to feel guilty because I felt the guilt was protective and would keep her from making the mistake again. Little did I realize what 140 characters could do and how life changing this event would be. In the course of the show, I was in contact with the producers so after the show ended, I asked them if I could get a letter to Amy because I felt there had to be a reason that someone who didn’t drink (myself) could have become so intertwined with someone struggling with alcoholism. My friend, Britt, was in the audience that day was one step ahead and she gave Amy my info. Within days we had connected and began an exchange. I was proud of Amy for going so public with her story and wanted to help uphold her in her sobriety and just be a friend if I could.We exchanged numerous messages over the next few months and held hands over the internet as this show aired on OWN for the first time. In October of 2012, I attended Oprah’s “O You 2012” event in Los Angeles. Matt and Amy attended too and we were able to meet in person for the first time. Our time in LA was amazing. We hung out during the event and later with friends with Matt at the wheel and Amy riding shotgun as we made our way around LA. As part of a special gathering with other OWN Ambassadors, I was able to meet and chat with Iyanla in person and tell her of the friendship that Amy and I had developed since the show taping. She didn’t seem surprised that this had happened. 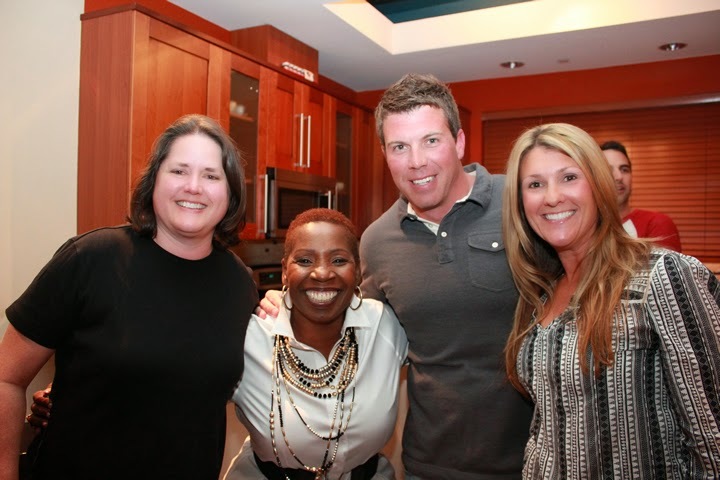 Later that same day, Amy, my friends and I were invited to a party and when we walked in, there was Iyanla! It was truly a full-circle moment. We attended church together and afterward had a special moment with Reverend Ed Bacon. I couldn’t believe it. Amy and Matt and I continued to talk after L.A. My family and I even visited Amy and Matt and their children at their home in PA during a family vacation. In fact, our daughters even became fast friends and chatted frequently via Skype. Amy and Matt continued to heal and move forward. They began a blog and began writing a book and started a charity to help others through the recovery process. They both stood in their truth and shared their story with others in hopes of helping others avoid their experiences. They shared their story through online interviews, on the news and during public speaking engagements. Amy continued to work toward a graduate degree and I was able to visit her again in 2013 to celebrate Amy’s graduation. I know that this climb has been a struggle. People have tried to knock them down and have tried to knock them off course. There have been some setbacks but slowly, steadily, Matt and Amy have climbed the hill together. They’ve continued to grow as a couple and as friends and today marks a huge day in their lives. 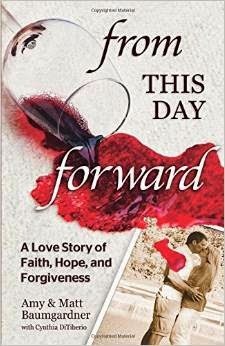 Today their book, “From This Day Forward: A Story of Faith, Hope and Forgiveness” hits book shelves. I cannot express how proud I am of Amy and Matt nor how grateful I am to have met them, become friends with them and had them in my life. They have helped me through some tough times and I have been there when needed too. Who would have EVER thought this would have happened? I now know that this is exactly how life happens when you speak from your heart and connect on a real and authentic level. Congratulations, Amy and Matt! Today is your day and I celebrate you!